If you have noticed, I cook a lot of things using produce that is in season. During August and September, I post 3 tomato recipes per week! Then October rolls around, and apple desserts are all the rage. Fall is just a great time for butternut squash, and I have made so many great recipes with this wonderful vegetable (in case you haven't noticed!) in the past few weeks. 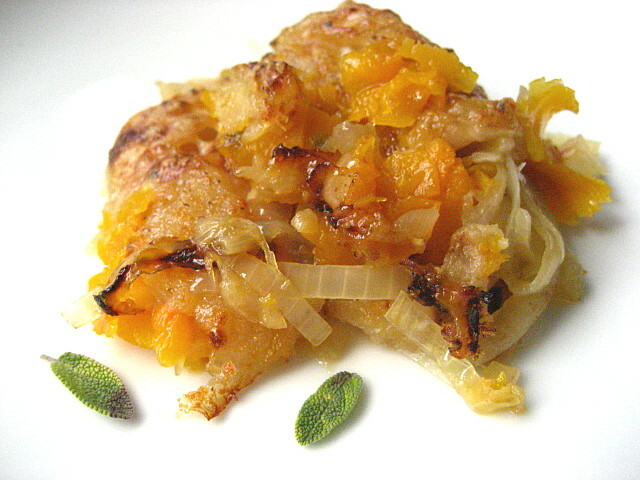 This wins the award for the BEST butternut squash dish I have tried so far. I can't wait to make it again. This recipe would be perfect for Thanksgiving. It is beautiful and fairly simple to make, just all the slicing can be a bit tedious. This recipe calls for 1/2 cup of dry Sherry. DO NOT buy the crap cooking Sherry that is in the salad dressing aisle of the supermarket (I don't want to mention brand names), it is filled with mostly preservatives and additives and is not really sherry. Sherry is from Jerez, Spain and the region is known for their fortified wine and it makes a different when using a good sherry to glaze the leeks. You can find many brands of real Spanish dry sherry at any liquor store. A big bottle was $7.99, and the garbage sherry cost 5.99. Spend the extra 2 bucks, it's worth it, trust me. Though, if you have to make this recipe RIGHT NOW, and don't want to make a liquor store run, then you can substitute a half cup of apple cider. Do you feel better now? The original recipe calls for leeks, but I had onions, and they worked perfectly. 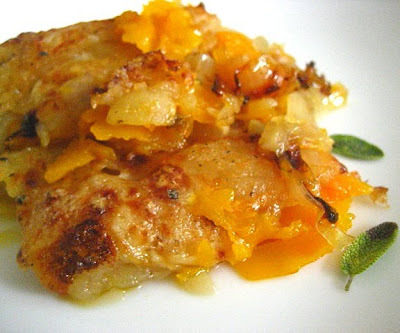 Butternut Squash Gratin w/ Apples & Caramelized Onions: (adapted from Whole Living & Ezra Poundcake) serves 6 as a side dish (you can double the recipe for a crowd). Cut up your squash (a fun chore), and slice super thin slices with a mandoline, preferably. In a large skillet, cook your sliced leeks or onions in olive oil, season w/ salt. Cook on medium about 8 minutes. Add 1/2 cup of Spanish dry sherry & sage to the pan (the pan may flare up, so be careful, you are adding alcohol). Cook another 3 minutes until the liquid is reduced to a glaze. 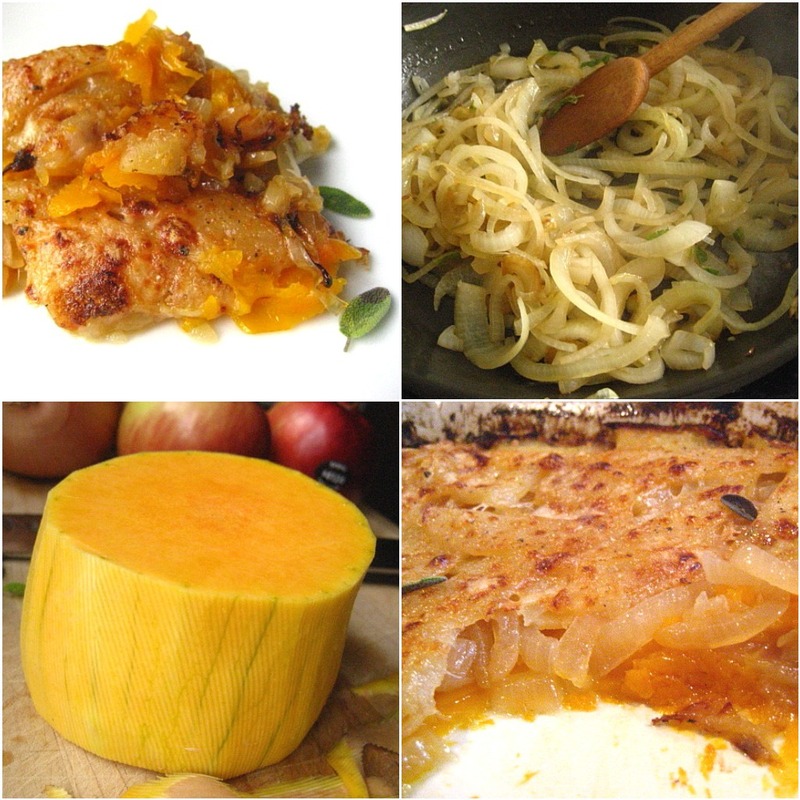 Butter a 2 quart shallow baking dish and place the thin slices of squash as the first layer, overlapping them neatly. Sprinkle with kosher salt. Next layer is going to be your leeks or onions. Lay them over the butternut squash. 3rd layer is the apple slices. 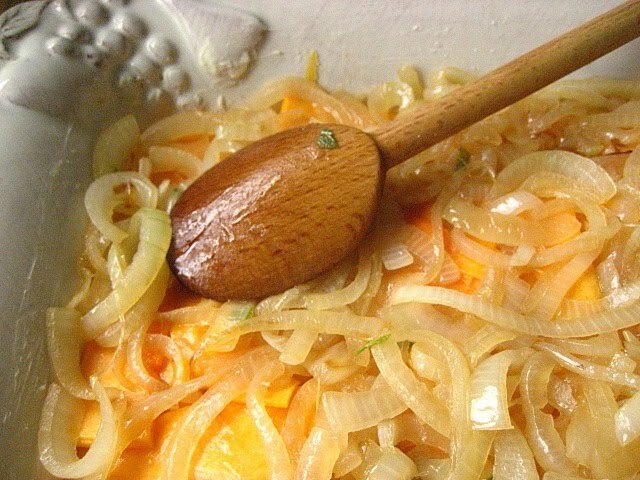 Layer the thin slices over the onions and sprinkle w/ salt and pepper. Drizzle with olive oil. Cover baking dish tightly with foil and bake about 50 minutes at 350F. Carefully uncover the dish and sprinkle w/ 1/2 cup of Parmesan cheese. Raise the oven temp to 450F and cook until the cheese is golden brown and melted. Let rest 10 minutes before serving and garnish with fresh sage leaves. Spoon out servings as a side dish. I LOVED THIS!!! I luv the rich color. LOL...my husband is the handy dandy slicer in our kitchen. He luvs to show off his knife skills. I am positively salivating over this one! Sounds absolutely delicious - I'll have to try it soon. Thanks for sharing! butternut squash and caramelized onions are a match made in heaven! 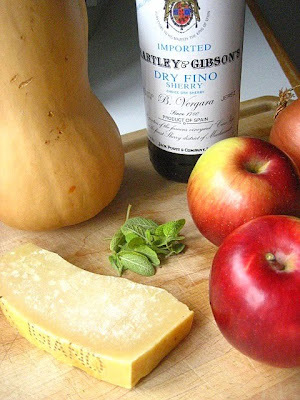 I will be trying this recipe out and not with crap sherry! Oh, Stacey. I'm in awe. I am so loving this recipe-- one of the best (and you post many) recipes I've seen. As you know, I recently overcame my aversion to BN squash. This gratin looks fabulous and I am going to queue it up for a special dinner. Ditto on not using that junk sherry (or cooking wine). You just reminded me that I need to buy dry sherry. I'm printing out right now... Happy Thanksgiving! 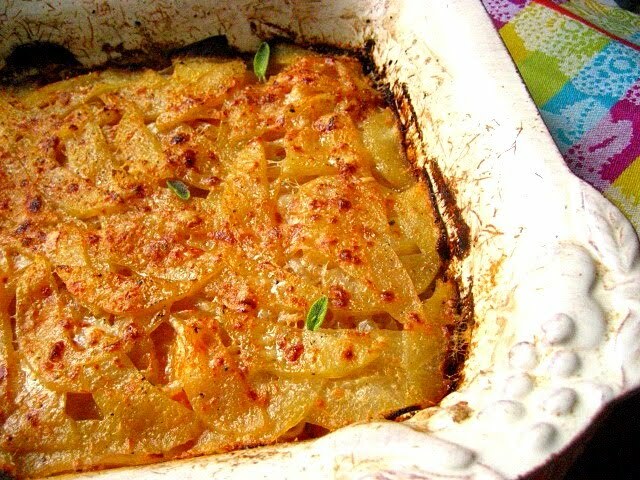 Thanks for this wonderful recipe for butternut squash gratin with apples and caramelized onions. The picture alone is mouth-watering! This looks like the best squash I have ever seen. I have to make this!! This dish turned out to be awesome! and it was the first time me cooking squash. One thing I'd say is that I had way too much squash leftover (if you are to have one thin layer of squash only) and I needed a bit more apples for the last layer but it could be my apples were on the smaller side. I'm making more of this today!